Taajush Shari'ah, Hadrat Allama Mufti Mohammed Akhtar Raza Khan Azhari Qadri, son of Mufassir-e-A'zam, Hadrat Mawlana Ibrahim Raza Khan (Alaihir Rahmah), son of Hujjatul Islam, Hadrat Mawlana Haamid Raza Khan (Alaihir Rahmah), son of Imam-e-Ahle Sunnah, Mujaddid-e-Deen-o-Millat, Ash Shah Imam Ahmad Raza Khan (Alaihir Rahmah) was born on the 25th of Safar 1942, in the district of Saudagran in the city of Bareilly Shareef, India. The name given to him during his Aqeeqah was Mohammed. He was also given the name Ismail Raza. However, the name by which he is famously known is Akhtar Raza. When he reached the age of 4 years, 4 months, 4 days, his respected father, Hadrat Mawlana Ibrahim Raza (Alaihir Rahmah), who was a great Islamic Scholar of his age, arranged for his Bismillah Kwaani (Commencement of Islamic Studies). His maternal grandfather, Ghousul Waqt, Mufti-e-Azam-e-Hind, Hadrat Mawlana Shah Mustapha Raza Khan Noori (Alaihir Rahmah), performed the traditional Bismillah Kwaani. All the students of the famous Darul Uloom Manzare Islam, which was originally built by the great Mujaddid Imam Ahmed Raza Muhaddith Bareilwi, were invited to this auspicious function. His mother, who is the blessed and pious daughter of Huzoor Mufti-e-Azam-e-Hind (Alaihir Rahmah), showed great concern for his study as she was certain that he would be the Khalifah (Spiritual Successor), of Huzoor Mufti-e-Azam-e-Hind (Alaihir Rahmah). Hadrat Allama Akhtar Raza Khan gained his basic Islamic education within his home and he completed the basic recitation and study of the Holy Qur'an under the guidance of his mother. He then studied further under the guidance of his father. Having completed his basic studies at home, Hadrat Mawlana Ibrahim Raza Khan (Alaihir Rahmah) enrolled him in Darul Uloom Manzare Islam in Bareilly Shareef. Here, under the guidance of renowned teachers, he studied many books, commencing with the basics such as, Mizaan, Munsha'ib, Nohmeer and proceeding to much more advanced books such as Hidaya Akhirain, etc. 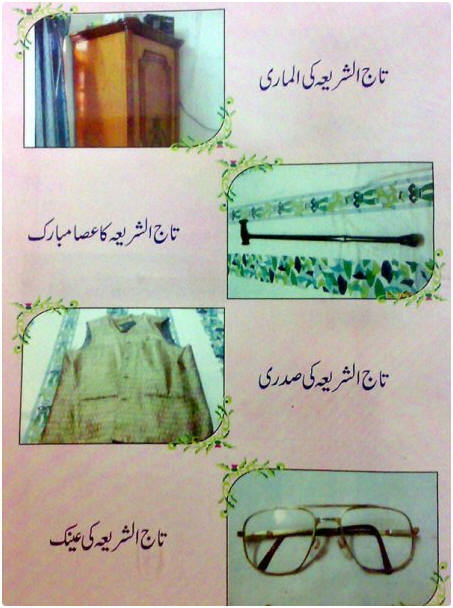 When Hazrat reached the age of 20, he was blessed with Khilafah by Ghousul Waqt, Huzoor Mufti-e-Azam-e-Hind (Alaihir Rahmah). This distinguished function took place on the 15th of January 1962. Many great personalities were present at this function. Amongst them were Shamsul Ulama, Mawlana Shamsuddeen Ahmad and Burhanul Millat, Hadrat Burhanul Haq. "I asked A'la Hadrat during his life time as to who his successor would be. A'la Hadrat replied that it would be Huzoor Haamid Raza. I asked him as to who will be after him. He replied that it would be Huzoor Mufti-e-Azam-e-Hind. I asked him as to who would be after him. He replied that it would be Jilani Mia (the father of Taajush SHari'ah), on the conditions of knowledge and practice. It is recorded that when A'la Hadrat made Jilani Mia his Mureed he wrote on his Shajrah the following words, "Khalifa, Insha-Allah, on conditions of knowledge and practice." As to the spiritual position of Taajush SHari'ah, Hadrat Mufti-e-Azam-e-Hind is reported to have said the following words concerning his Successor, "I HAVE A LOT OF HOPE ON THIS LITTLE BOY?" 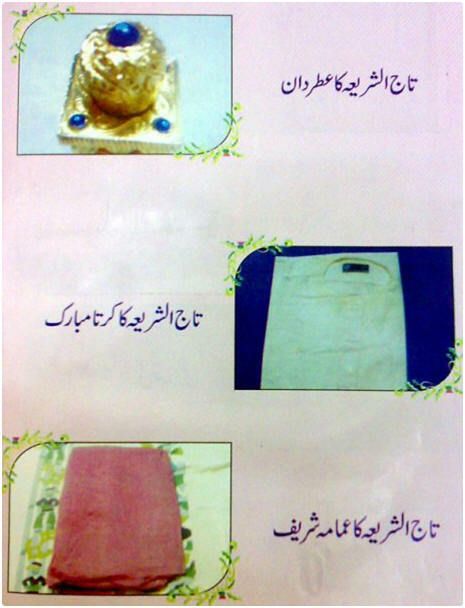 (meaning Allama Mufti Mohammed Akhtar Raza Khan Qadri Azhari). During the latter stages of his life Huzoor Mufti-e-Azam-e-Hind (Alaihir Rahmah) gave his statement in writing to Hadrat Allama Akhtar Raza Khan. On the 14th and 15th of November 1984, when Allama Mufti Mohammed Akhtar Raza Khan presented himself at the feet of Ahsanul Ulama, Hadrat Mawlana Sayed Hassan Mia Barakaati (Alaihir Rahmah), who is the Sajjadah Nasheen of Khanqah Aaliyah Barakaatiyah Marehrah (Marehrah Shareef) he was welcomed with the following words: QAA'IM MAKAAM HUZOOR MUFTI AZAM! ALLAMA AZHARI! ZINDA BAAD! "As the Head of the Khanqah-e-Aaliyah Barakaatiyah Nooriyah, I AM PRESENTING ALLAMA AKHTAR RAZA KHAN ALL THE KHILAAFAH AND THE SPIRITUAL PERMISSION OF THE FOLLOWING SPIRITUAL ORDERS - QAADRIYA, BARAKAATIYAH, NOORIYAH. Let all those gathered hear this, let all Barakaati Mureeds hear this and all the Ulama that are present bear witness to this." After uttering these words, Hadrat Mawlana Sayed Hassan Mia Barakaati (Alaihir Rahmah) tied the traditional Amamah (Turban) around the head of Hadrat Allama Akhtar Raza Khan Azhari and also gave him some money as a gift. He has also received Khilafah from Sayyidul Ulama, Mawlana Sayyid Aale Mustapha and Mawlana Burhanul Haq Razvi. Even while he was still a student, Hadrat Mawlana Ibrahim Raza (Alaihir Rahmah), issued a statement in which he made his son, Hadrat Allama Akhtar Raza Khan Azhari, as his spiritual Successor. In 1963, at the age 21, he was sent to Cairo in Egypt to study at the famous Al Azhar University. He studied Tafseer of the Holy Qur'an and Ahadith for 3 years at this Islamic University. It has been stated that even as a child, he was very intelligent, a person of great wisdom and he possessed an excellent memory. While studying at the Al Azhar University, teachers and students were surprised when he conversed with them in superior Arabic. When he spoke to them, they would often look stunned at his mastery over the Arabic language. The examinations conducted at Al Azhar University are mostly done in writing, however the general knowledge sections were tested orally. It is stated that when the students were asked general knowledge questions by the examiner, none of them were able to answer these questions. The examiner used to then direct these questions to Mufti Mohammed Akhtar Raza Khan. He used to reply to each question in such an intelligent manner that it often surprised the examiner. When the examiner questioned him on how he managed to answer intricate questions on the topic of Ilm-e-Kalam (Knowledge of Imaan), even though he was only studying Ahadith and the principles of Ahadith, he used to reply, "I studied this subject while I was still a student at Darul Uloom Manzare Islam." He also used to achieve first position during every examination. His studies continued at the Al Azhar University and he began achieving more success in the academic field as the days passed. He achieved the distinction of being one of the best foreign students to have studied at Al Azhar University. Even till this day, ex-students of the Al Azhar University still remember him is this fashion. In one famous monthly magazine, this distinction was echoed in the following words: "The grandson of Huzoor Hujjatul Islam, Mawlana Haamid Raza Khan and the son of Jilani Mia, Hadrat Ibrahim Raza Khan graduated with a B.A. degree in Arabic in a most worthy and excellent manner. HIS EMINENCE DID NOT ONLY COME FIRST WITHIN THE CONFINES OF THE AL AZHAR UNIVERSITY, BUT ALSO FIRST IN THE WHOLE OF CAIRO. May Allah grant him more success, make him worthy of propagation, and may be known as the true Successor of A'la Hadrat." Upon graduating from the Al Azhar University, Allama Akhtar Raza Khan was awarded the Jamia Azhar Award by Colonel Jamaal Abdul Nassir. He was also presented with a Certificate of Merit in the field of Ahadith. After graduating and receiving the Al Azhar Award, he returned home to continue his Islamic mission. "A beautifully coloured and scented rose from the garden of A'la Hadrat, his Eminence, Mawlana Akhtar Raza Khan, the son of Hadrat Mufassir-e-Azam Hind, Mawlana Ibrahim Raza Khan arrived in Bareilly Shareef after a lengthy stay at the Al Azhar University. He has arrived in Bareilly Shareef after completing his studies at the Al Azhar University in Cairo. "He was welcomed at the Bareilly Junction Railway Station by many well-wishers, friends, families, great Ulama and students of Madressa Manzare Islam. Under the spiritual supervision of Huzoor Sarkaar Mufti-e-Azam-e-Hind, they all welcomed him. They showed his Eminence a great deal of love, respect and adorned him with garlands prepared from colourful flowers. "This organization congratulates Mawlana Akhtar Raza Khan and his relatives on such a success. We pray that Almighty Allah with the Wasila of the Prophet make him the true successor of his forefathers, especially of A'la Hadrat, Imam-e-Ahle Sunnah, Mujaddid-e-Deen-o-Millat, Imam Ahmed Raza Khan." Taajush Shari'ah married the daughter of Hakimul Islam, Mawlana Hasnain Raza Khan on Tuesday, the 3rd of November 1968, in Bareilly Shareef. From this marriage were born 6 children, one son and five daughters. His sons name is Muhammad Muhaamid Raza and he is also known as Asjad Mia. His maternal grandfather, Huzoor Mufti-e-Azam-e-Hind, Mawlana Shah Mustapha Raa Khan Noori Barakaati (Alaihir Rahmah). Bahrul-Uloom, Mawlana Sayed Afzal Hoosen Razvi. His father, Mufassir-e-A'zam Hind, Hadrat Mawlana Ibrahim Raza Khan (Jilani Mia) (Alaihir Rahmah). Hadrat Mawlana Allama Muhammad Simahi- Sheikul Hadith and Tafseer, Al Azhar University. Hadrat Mawlana Mahmood Abdul Ghaffar - Al Azhar University. Ustaaz-ul-Ulama, Mufti Muhammad Ahmad Jahangeer Khan Razvi. In 1967, at the age of 25, he was appointed a Lecturer at Darul Uloom Manzare Islam. He gladly accepted this position and commenced teaching. In 1968, his eldest brother, Hadrat Mawlana Rehaan Raza Khan, offered him the post of the Principal of Darul Uloom Manzare Islam which he humbly accepted. He was also appointed at the same times as the Head Mufti of the institute. The service continued for the next 12 years. He supervised the Madressa with such distinction that it continued to prosper and improve. Later on, due to his wide travels around the world for propagation purposes, he began to give private tuition of the Holy Qur'an and many students came from far and wide. In 1986 and 1987, he performed the blessed completion of the Sahih Bukhaari Shareef at Jamia Islamia Ganj Qadim in Rampur. In the beginning of 1987, he again commenced the teaching of Sahih Bukhaari Shareef at Madressa Farooqiya and again in 1988, he taught the Sahih Bukhaari Shareef at Jamia Amjadia, Karachi. Later in that year, he also taught Shaya Waqqaya (a famous book on Islamic Jurisprudence) to students at the Al Jamiatul Qadria. Hadrat Mawlana Mufti Mohammed Akhtar Raza Khan Azhari also has an excellent command of the English language. This service to humanity has always been a feature of the family of Sayyiduna A'la Hadrat. If we examine the details listed below, we will gain an insight as to the lengthy period in which this service was upheld by this August Family. 1831 to1865 - Hadrat Mawlana Raza Ali Khan (Alaihir Rahmah). 1895 to 1942 - Hadrat Mawlana Haamid Raza Khan (Alaihir Rahmah). 1910 to 1981 - Hadrat Mawlana Mustapha Raza Khan (Alaihir Rahmah). One can see by the above that this service has been offered to the world community for the past 163 years. Continuing in this vein, Taajush Shari'ah continues to answer questions pertaining to various issues relating to Islam and the world. He has continued this since when he was only 17 years old and under the spiritual guidance of Ghous-ul-Waqt, Huzoor Mufti-e-Azam-e-Hind (Alaihir Rahmah) and Mawlana Muhammad Afzal Hussain Razvi. Due to the tremendous work load and inquiries received from all parts of the world, many other Islamic scholars work under the direct supervision of Taajush Shariah to fulfill this great need. "Akhtar Mia! There is no time to sit at home. It is for you to take care of this task, therefore, I am handing it over to you.? The great Saint then turned to those present and declared, ?ALL OF YOU SHOULD NOW TURN TO AKHTAR MIA. HE IS NOW MY SUCCESSOR." "I had Already joined the Spiritual Order Of Huzoor Mufti-e-Azam-e-Hind during childhood. On my return from Jamia Azhar and due to preference, I became involved in presenting Fatawa. At the early stages, I performed this duty under the supervision of Mufti-e-Azam-e-Hind to show him my work. After sometime, I became more inclined towards this task and continuously presented myself before Huzoor Mufti-e-Azam-e-Hind (Alaihir Rahmah). In a very short period and due to the Spiritual Benediction of Huzoor Mufti-e-Azam-e-Hind, I achieved immense benefit in this faculty." For the past 30 years, Taajush Shari'ah has continued this task entrusted upon him by great spiritual luminaries. His Islamic Verdicts (Fatawa) are recognized and accepted throughout the world. As a point in passing, the Islamic verdicts issued by Taajush Shari'ah to date stands at nearly 5000, enough to fill many volumes. On the 18th of August 1984, he arrived at a place called Junagardh for a gathering organized by Bazme Raza at the Junagardh Masjid. There were many Ulama present at this function wherein Taajush SHari'ah received the title of Taajul Islam (Crown of Islam). This title was also confirmed by the Mufti of Gujurat, Mufti Ahmed Mia Sahib. Hadrat was also given the title of Faqih Islam (The Jurist of Islam) by Sheikh-ul-Hadith, Mawlana Mufti Sayed Shaahid Ali Razvi Rampuri. He was also given the title of Taajush Shariat (Crown of Shari'ah) and Marja'i Ulama. Besides this, he has also received many other titles around the world bestowed upon him by eminent Scholars of Islam. In September 1983, he performed his first Hajj and in 1986, he performed his second Hajj. He is also been blessed with performing many Umrah. On the 13th of September 1986, a massive protest occurred against the Saudi regime in Bombay. The reason for this was that thousands of Muslims were informed that Taajush Shari'ah has been imprisoned in Saudi Arabia. This protest was held under the leadership of Sheikh-ul-Hadith, Hadrat Allama Zia-ul-Mustapha Al Qaderi Amjadi. Nearly 50000 people took part in this procession which included many Imams, Ulama and renowned Islamic leaders. The protesters displayed great anger and showered much scorn on the Saudi Government. As a result of this protest and others which took place, Hazrat was finally released by the Saudi Mischief makers. "On the evening of the 31st of August 1986, at approximately 3 0?clock, a C.I.D. accompanied by uniformed police officers arrived at my hotel room and without warning searched for my passport. They then demanded to search my luggage. I then requested my wife who was in Purdah to go into the bathroom. A revolver was then pointed at me and I was not asked to move. They then began searching my luggage. I had in possession at that moment, a few books presented to me by Mawlana Sayed Alawi Maliki and a few books of A'la Hadrat. I also had a copy of the Dalaa'ilul Khairaat Shareef. They confiscated these books and requested a diary which I did not possess. They then confiscated our passports and tickets. "That same night I was questioned on various issues. The first question pertained to where I had performed the Jum'uah Salaah. I replied that I was a traveler and that Jum'uah Salaah was not Fardh upon me, I therefore had performed Zohr in my house. "They asked me if I had ever read Salaah in the Haram Shareef. I replied that since I was staying a distance from the Haram, I only went there to perform the Tawaaf. "They then questioned me on the books of Mawlana Sayed Alawi Maliki and as to how I had received them. I told them that the great Scholar had presented them to me a few days ago when I went to visit him. "After looking through a few books of A'la Hadrat, which pertained to the reading of Na'at and various laws of Hajj, they questioned me about my relationship to A'la Hadrat. I told them that he was my paternal grandfather. "At the end of this session in which the entire night had passed, they then placed me in a cell at the time of Fajr Salaah.? "The same day at about 10 o'clock, I was again questioned by the C.I.D. about the various sects found in India. I explained that among the various sects were the Shi'a and the Qadianis. I also pointed out to him that A'la Hadrat had opposed the Qadiani sect and various other corrupt sects and in opposing them he had written many books. "I then revealed to him that there is a trend to call us Bareilwis. By this, one conceives a notion that the Bareilwis are a new sect. I revealed that this was not so and that in reality we were really the true Ahle Sunnah Wa Jamaah. I explained that A'la Hadrat did not lay the foundation of a new sect. His teachings were based on the religion of the Holy Prophet Muhammad, the Ashaab, the Tabi'een and the pious people of the past and that we preferred being called the Ahle Sunnah Wa Jamaah. "I then explained to him the difference between the Sunni and the heretic Wahabi. I explained that the Wahabi disbelieves that the Holy Prophet Muhammad possesses Knowledge of the Unseen (as given to him by the Almighty); they do not believe that he will intercede for the creation and they consider it Shirk to ask the Holy Prophet or any Saint for assistance. "I then explained that we Sunnis believe that the Prophet will intercede and that it is permissible to call to him and to believe in him as a Mediator. We believe that he hears our speech by Allah?s Grace and he certainly possesses the Knowledge of the Unseen by the Grace of the Almighty. "I then proceeded to present many Qur'anic proofs and various authentic sources substantiating the beliefs of the Ahle Sunnah Wa Jamaah. "On the second day, he presented a typed report of a statement which read, "I, Akhtar Raza, the son of Ibrahim Raza is a follower of the Bareilly religion." I furiously objected to this and again reminded him that Bareilly is not a religion and if there was such a new religion then I was certainly not part and parcel of it. Thereafter, in various different methods, I was asked basically the same question. I was questioned about the journey to London and asked whether I had attended any conference there. I mentioned that a conference is held on the command of the Government and on the height of politics. I told him that we are neither politicians, nor do we have contact with any Government. The main theme of the conference was the unity of the Muslims and the issue of Muslim Personal Law. The entire cost of this Conference was borne by the Sunni Muslims of London. I mentioned that a request was presented at the Conference whereby it would be possible for a Sunni to be nominated in the Muslim World as the Nadwis are given unfair advantage. I further mentioned that this resolution was unanimously accepted and the law passed. "At that moment, one of the senior CID's approached me and uttered, 'I must admit that I respect you for your age and knowledge, and perhaps in better circumstances I would have requested you to make Du'a for me.' When I questioned him about the reason I was arrested, he did not reply adequately but merely mentioned that, it was he who had requested the police to remove my handcuffs. "They deliberately delayed my release without prosecuting me, and in the process deprived me from visiting Madinah Shareef. After 11 days. I was transported to Jeddah in handcuffs till until we reached the airport. They did not even allow me to perform the Zohr Salaah on the journey and I had to make this Salaah Qazah." We have seen that the Saudi Government had arrested Hazrat without any reasons. He was imprisoned for 11 days and the punishment was that he was not even allowed to visit Madinah Shareef. It is due to this tyrannical behavior that thousands of Sunni Muslims throughout the world felt enraged and hurt. It gave birth to many protest marches and numerous news agencies had a field day reporting the incident. At the end of this sacrifice, King Fahad had to grudgingly make the following statement, "MUSLIMS FROM ALL WALKS OF LIFE WILL BE ALLOWED TO MAKE IBAADAH ON THEIR WAY IN SAUDI ARABIA." This demonstration continued and the World Islamic Mission representatives in London severely replied to King Fahad and his brother, Turki ibn Abdul Aziz, concerning the controversial Wahabi beliefs. Hadrat Allama Arshadul Qadri also presented a memorandum in Arabic to the Ambassador of Saudi Arabia. With the result, that on the 21st of May 1987, Taajush Shari'ah received a call from the Saudi Embassy in Delhi with this message: "The Government of Saudi Arabia has decided to present you with a special Visa so that you may perform the Umrah and may visit Medina Shareef. This special visa is valid for one month." On the 27th of May 1987, when Taajush Shari'ah arrived to perform these duties, he was met by a Saudi Ambassador was shown great courtesy and respect. After 16 days he returned to India and was warmly welcomed by a huge crowd both the Delhi and Bombay stations. It was reported that Ghousul Waqt, Huzoor Mufti-e-Azam-e-Hind (Alaihir Rahmah) had once commanded Muslims to become the Mureeds of Allama Akhtar Raza. Once, he also personally made a huge group of Muslims become the Mureeds of Taajush Shari'ah. When he was sent to various places under the direction of Huzoor Mufti-e-Azam-e-Hind (Alaihir Rahmah), vast numbers of Muslims became his Mureeds. 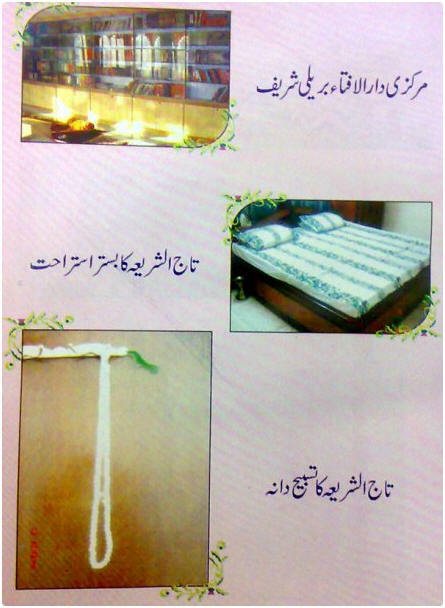 Taajush Shariah possesses thousands of Mureeds in many countries and cities such as Iraq, Pakistan, Medina Shareef, Mecca Shareef, India, Bangladesh, Sri Lanka, Mauritius, United Kingdom, Holland, London, South Africa, America, Riyadh, Iran, Turkey and in Malawi. They are also Muslims from all walks of life and among them, there are great Ulema, Mashaa'ikhs, great poets, prose writers, authors, doctors and research scholars. He first arrived in South Africa in the year 1990 (invited by Mawlana Abdul Hadi Al-Qaadiri Radawi, President of the Imam Ahmed Raza Academy) and has been coming here each here ever since on the invitation of his Mureeds. 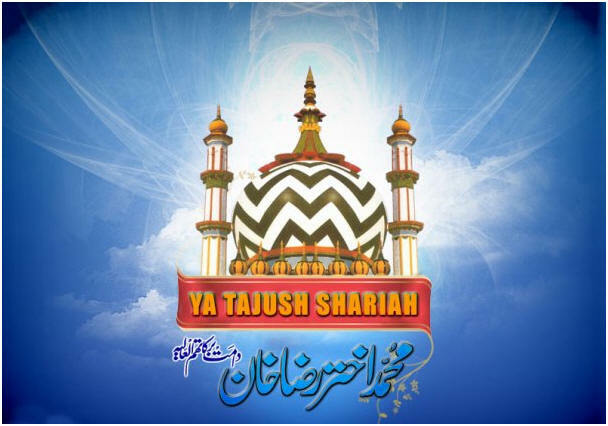 Taajush Shari'ah, following the great tradition of his illustrious family and whose love for Sayyiduna Rasoolullah (sallal laahu alaihi wasallam) knew no bounds, has composed many a Naat Shareef. By these compositions one is able to estimate his immense love and reverence for Sayyiduna Rasoolullah (sallal laahu alaihi wasallam) . His composition of Naath Shareef is found in a book entitled Safina Bakhshish, which he written in 3 different languages. The first Na'at that he wrote was when he was only 19 years old. Hadrat has traveled far and wide to help strengthen the faith of the weak Muslims have accepted Islam at his blessed hands. From among them, we have presented the experiences of a few. FIRST INCIDENT: Muslim Razvi, previously known as Riyawar, was a vey young boy and lived in Jabalpur. He left home and had no place to go to. It so happened that he met a group of Sadhus who invited him to live with them. His entire life as a teenager was spent in there company. From among his friends, one of them was a Muslim. They used to be classmates when Muslim Razvi was still very young. It was from this friend that he heard about Islam. After living with this Sadhus for such a lengthy period, he still did not feel that he had achieved much peace, with the result he began studying books on Islam. When he asked about his acceptance in Islam, Muslim Razvi replied, "I felt true peace after reading these books and I therefore decided to accept Islam. I then went to Bareilly Shareef. There I saw a person whose face shone like the moon. When I asked who he was, I was told that it was his Eminence. After looking at his bright face, I became even more confident. I then asked his permission to recite the Kalima and then officially accepted the pure Religion of Islam." SECOND INCIDENT: Muhammad Ahsan Razvi was first known as George Stephen. He lived in the city of Punjab and was a staunch Roman Catholic. By occupation, he was a Roman Catholic teacher and a famous preacher. He was unlike any other Christian. He was so proficient in his job that he was also given the task of making a comparison between the Holy Qur'an and the Bible so that he could put error in the Holy Quran. He was also a master in the Urdu language and well versed in the Arabic and Persian languages. At present, Muhammad Ahsan Razvi is a very good reciter of the Holy Qur'an. He accepted Islam and became a Mureed of Taajush Shari'ah in 1986. After accepting Islam, he stayed a while with Hazrat under his guidance. He began fasting, performing his Salaah and learning more about the Deen of Islam. It is to be noted that he found the address of Bareilly Shareef while he was scanning through the pages of Fatawa Radawiyyah. When he arrived in Bareilly Shareef he admitted that he had already studied the Wahabi, Deobandi and Shi'ite sects, and had arrived at the conclusion that the true Islam was being been preached in Bareilly Shareef to accept Islam. He admits that before accepting Islam his mind was in a total state of confusion for at least 6 months. He often believed that the Bible which he was teaching was not the true and real Bible. He knew that Muhammad was mentioned in the true Bible. And that this original Bible had described the Holy Prophet as a Mercy for the worlds that he was the Final Messenger. THIRD INCIDENT: In 1988, Muhammad Ahsan Razvi's wife, daughter and two sons also accepted Islam. His wife's former name of Sandra Masih was changed to Maryam Khatoon. Peter and Moses, his two sons, were named Muhammad and Mahmood Hassan Razvi, respectively. Their daughter, Rosina, was named Qhanis Fathima. FOURTH INCIDENT: It is reported that a teenage girl named Ustai, used to live among ignorant Hindus. She was about 20 years old and on the 29th of September 1989, she came to Bareilly Shareef and accepted Islam at the hands of his Eminence. She also became his Mureed. She admits that she was never forced to accept Islam and that she firmly believed that Islam was the purest of all religions. FIFTH INCIDENT: In 1989, a Hindu from Rai Bareilly also accepted Islam and has given an account on why he did so. He said: His father had died. According to the Hindu religion the youngest or eldest son had to burn the father's body and also hit the body with a Bamboo pole. he took on this responsibility and hit his father's head with the pole. He suddenly realized how wrong this was and immediately knew that Islam was the true religion. That night, as he slept, he dreamt that he saw himself in a new Masjid. He then sees an elderly and bright-faced person in the Masjid. The person is saying to him, "Son! Recite the Kalima." He says that he then recited the Kalima in his dream. One day he decided to go to Bareilly Shareef. As he entered the district, he eyes fell on Taajush Shari'ah. So shocked he became that he began screaming, "I saw this pious man in a dream and he asked me to recite the Kalima." He immediately accepted Islam at the hands of his Eminence and he was given the name Abdullah. Allah azza wajal has blessed Taajush Shari'ah with exceptionally good qualities. His actions display his immense love for the Sunnah of the Beloved Prophet. One needs to be in his company to witness this. As Huzoor Mufti-e-Azam-e-Hind (Alaihir Rahmah), Taajush Shari'ah has always displayed discomfort for those who do not have proper beards and who were gordy westernized clothes. Like Mufti-e-Azam-e-Hind (Alaihir Rahmah) he also shows great displeasure towards those who wear ties. This is not aimed at the wearer of this Tie, but rather at the institution of the Tie. When adorning clothes or putting his shoes, he is very conscious of not violating the Sunnah. 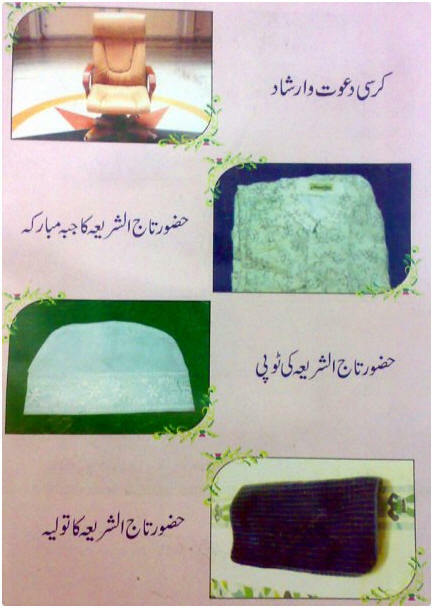 He loves using I'tar and great care is taken when putting on his Amamah (Turban). He always sits and eats on the floor and follows the Sunnah meticulously. He evens follows the Sunnah of taking a pinch of salt before eating. Whenever he sits in a Meelad-un-Nabi or Mehfil-e-Zikr, he always sits with utmost respect until the very end. He displays great emotions when a Naat Shareef is being read. He always makes certain that the person reading the Naat Shareef uses proper words and is ever ready to correct the reciter. When visiting the Mazaar Shareef, he sits with humble submission and respect. While travelling, he continuously recites the Naat Shareef when everyone is silent. He shows great respect for the Ulama and always gives them preference over others. He respects the Sayeds, (Family of the Holy Prophet - sallal laahu alaihi wasallam) in a manner as a slave respects his King. He always makes Sayeds sit close to him, even if they are Ulama present. If a Sayed sat on the floor and he became aware of it, he would immediately sit on the floor very afraid of showing disrespect. He prohibits Muslims from keeping un - Islamic names. He has advised such names as Abdullah, Abdur Rahmaan, Muhammad and Ahmad. He dislikes using the name Rahmaan for a person. He has said that since this is one of the Beautiful Names of Allah, we should use the persons full name Abdur Rahmaan. Taajush Shari'ah's entire life has been spent making Jihad against the enemies of Islam such as the Deobandis, Wahabis, Maududis, Ibn Taimiyya, Qadianism, or Najdism. He has always propagated the truth found in the Ahle Sunnah Wa Jamaah. And with his advice, he has helped protect the Imaan of not only the Muslims of India, but of Muslims throughout the world. He has attacked the enemies of Islam throughout his writings and his actions. He has done everything in his capacity to challenge the enemies of Islam. He has always paid special concern to those Sunnis who he felt were being misled and always made it his duty to show them the true path of the Ahle Sunnah Wa Jamaah. Taajush Shari'ah has always performed his Salaah in Jamaah whether he was on a journey or not. When performing Wudhu, he washes all the parts thoroughly so that the Sunnah is performed. He always advises those who are performing their Salaah to fasten their top buttons, to read their Salaah with long sleeve shirts and remove their Ties. He also advises the males to wear their shirts out of their pants when performing Salaah. Taajush Shari'ah also stresses on the performance of correct actions within Salaah. He never perform Salaah using the mike system and strongly disapproves of this. Presently one is saddened to see certain so-called Peers, Faqeers and Aalims, who claim to follow the Shari'ah, but are surrounded by women. Taajush Shari'ah strongly disapproves of this total lack of Purdah. He disapproves of males sitting in the midst of females and never sits alone with females. Taajush Shari'ah also strongly disapproves of women sitting inside Mazaars without any Purdah. Hadrat also strongly disapproves of video-taping and insists that the video recorders be turned off. He does not enter a Mehfil where video-taping is being done. He also does not like Muslims watching television. In this regard, Taajush Shari'ah has written a book proving that the use of the video and television is not permissible in Islam. Hadrat does not approve of Muslims keeping photograph. Compromises with any person is never allowed in Islam. Although facing arrest and being locked p in a prison cell in a country that was known for its humans right violations, he accepted his fate, yet never compromised with the authorities in matters concerning Shari'ah. His verdicts are based on Shari'ah and never to please any person of group. We make mumble Du'a that Allah azza wajal, through the Wasila of Sayyiduna Rasoolullah (sallal laahu alaihi wasallam) and through the Sadaqah and Wasila of Imam-e-Ahle Sunnah, Ash Shah Imam Ahmad Raza Khan and Ghousul Waqt, Huzoor Mufti-e-Azam-e-Hind, Mawlana Mustapha Raza Khan Noori Barakaati (Alaihir Rahmah) grants Taajush Shari'ah long life, good health and the strength to continue serving the Ahle Sunnah Wa Jamaah and to serve as an inspiration to the sincere seekers of truth. Ameen.